monitor a patient's immune response. A team of researchers from the University of Illinois and Carle Foundation Hospital in Urbana, Illinois, completed a clinical study of a new portable device that can quickly find markers of deadly, unpredictable sepsis infection from a single drop of blood. The device, which is the first to provide rapid, point-of-care measurement of the immune system's response, without any need to process the blood, can help doctors identify sepsis at its onset, monitor infected patients and could even point to a prognosis. The findings were published in the journal Nature Communications. Sepsis is triggered by an infection in the body. The body's immune system releases chemicals that fight the infection, but also cause widespread inflammation that can rapidly lead to organ failure and death. Sepsis strikes roughly 20 percent of patients admitted to hospital intensive care units, yet it is difficult to predict the inflammatory response in time to prevent organ failure, said Dr. Karen White, an intensive care physician at Carle Foundation Hospital. "Sepsis is one of the most serious, life-threatening problems in the ICU. It can become deadly quickly, so a bedside test that can monitor patient's inflammatory status in real time would help us treat it sooner with better accuracy," White said. Sepsis is routinely detected by monitoring patients' vital signs - blood pressure, oxygen levels, temperature and others. If a patient shows signs of being septic, the doctors try to identify the source of the infection with blood cultures and other tests that can take days - time the patient may not have. The new device takes a different approach. "We are looking at the immune response, rather than focusing on identifying the source of the infection," research team leader Rashid Bashir said. "One person's immune system might respond differently from somebody else's to the same infection. In some cases, the immune system will respond before the infection is detectable. This test can complement bacterial detection and identification. We think we need both approaches: detect the pathogen, but also monitor the immune response." 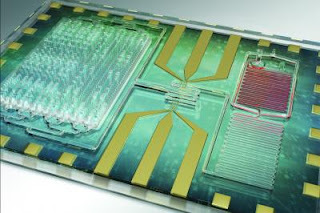 The small, lab-on-a-chip device counts white blood cells in total as well as specific white blood cells called neutrophils, and measures a protein marker called CD64 on the surface of neutrophils. The levels of CD64 surge as the patient's immune response increases. The researchers tested the device with blood samples from Carle patients in the ICU and emergency room. When a physician suspected infection and ordered a blood test, a small drop of the blood drawn was given to the researchers, stripped of identifying information to preserve patient confidentiality. The team was able to monitor CD64 levels over time, correlating them with the patient's vital signs. Researchers found that the results from the rapid test correlated well with the results from the traditional tests and with the patients' vital signs. "By measuring the CD64 and the white cell counts, we were able to correlate the diagnosis and progress of the patient - whether they were improving or not," said Umer Hassan, a postdoctoral researcher at Illinois and the first author of the study. "We hope that this technology will be able to not only diagnose the patient but also provide a prognosis. We have more work to do on that." Bashir's team is working to incorporate measurements for other inflammation markers into the rapid-testing device to give a more complete picture of the body's response, and to enable earlier detection. They also have a startup company, Prenosis Inc., that is working to commercialize the device. "We want to move the diagnosis point backward in time," Bashir said. "The big challenge in sepsis is that no one knows when you get infected. Usually you go to the hospital when you already feel sick. So the goal is that someday you can be testing this at home, to detect infection even earlier if you can."